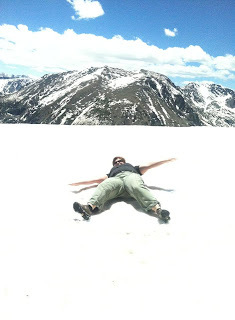 Katie made a snow angel in the Rocky Mountains! 12,000 feet! She gets the altitude award for snow angels, I'd say. I loved all the snow angels. I hope I got all of them published. I told my brother, Bruce, yesterday that I have too many ways for information to get into my head. Sometimes I look at an email on my phone in the car and by the time I have landed, it has flitted out of my head. Miss Darby with her blue heron doppelganger, Duke of Earl. I went out to fill the bird feeders early this morning (Were you watching, Dad?) and it feels like we're on the shores of Lake of the Woods where the ice is barely off the water. It's beautiful, though...everything is so green and lush. Sharon said we are living in the Emerald City. There is an absolute chorus of orioles in the yard this morning. We should be more like birds. No matter what the weather or the circumstances, they just go on with their singing, their bird seed eating, and their flitting about the yards. One oriole has been singing in the neighbor's maple tree for more than an hour...non-stop. I'm so glad my parents taught me an appreciation for birds and nature. I told Mom yesterday, that no matter how many times we see an oriole or a cardinal or a rose breasted grosbeak at our feeder, we point and go "ahhh...look!". I have been reading a tiny bit about the finance man behind Tom Petters who is currently on trial for fraud. I seriously don't get it. He's like an alien life form or a character from a Carl Hiaasen novel. Here's a link to the whole mess if you're curious. At least check out the photos and the character descriptions. The guy's suit and tie are what got my attention. Where do you buy clothes like that? At the store for shysters? Regarding Carl Hiaasen, I have been reading his books like a mad woman and now Regis is interested. Carl has a very cynical view of the government and its role in the preservation of the environment, particularly in Florida, but his books are laugh-out-loud funny. And probably enough truth to be frightening. Don't you love that I call him Carl, like I know him? I did put the link and a comment on Facebook, alerting him to the story. I'm sure he will appreciate the tip. I better get moving. Yesterday, with all our running around, I ate crap. It's a shame that medical facilities serve food like they do and I won't even go into the Egg McMuffin I had at McDonald's. Well, maybe I will. That only served as sustenance and not good sustenance at that. 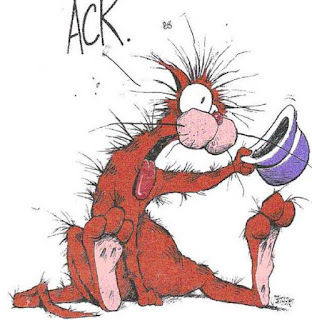 Ack, as Bill the Cat says.